Tomorrow (1 July 2018) marks 100 years since the beginning of the Battle of the Somme. During the Somme Offensive, 420,000 British soldiers were killed, and the battle as a whole is remembered as one of the greatest losses of life in war in human history. There are many upcoming events around the UK to commemorate the lost generation of WW1, including sculptural art commissions by 14-18 Now (a 5 year arts programme connecting contemporary society with WW1), exhibitions and thought provoking performances. In a brand new work commissioned by 14-18 Now celebrated contemporary Kathak choreographer Akram Khan makes his final performances as a dancer in a full length piece. In Xenos – seemingly named after the Jordan Tannahill poem of the same name – Khan draws on 20 Century archive material, and aims to give a voice to the shell-shocked dream of a colonial soldier in the First World War. Joined by a stellar creative team, including long-time collaborator and lighting designer Michael Hulls, Khan’s latest work promises to reveal the oxymoronic nature of the human condition. Xenos is being performed by Akram Khan at the Festival Theatre Edinburgh from 16 – 18 August, and at the Curve Theatre, Leicester from 21 – 22 September. Part of Making a New World – a season of exhibitions and immersive experiences at IWM London and IWM North explore WW1’s impact on contemporary society – Lest We Forget is a new exhibition which examines how we commemorate the war, from wearing poppies to owning personal mantelpiece memorials, national observances of silence to sewing symbols into football shirts. On display will be 180 objects, photographs, film clips, sound pieces and documents from various time periods, including a photograph showing the selection of a body for The Unknown Warrior the original Joey puppet from the National Theatre’s production of War Horse. There will also be iconic paintings on display by artists including Paul Nash, Stanley Spencer, Wyndham Lewis and John Singer Sargent. These paintings were originally commissioned by the UK government in 1918 for a WW1 Hall of Remembrance which was never built. Lest We Forget? is running at IWN North, Manchester from 27 July 2018 – 24 February 2019. Since its debut at The Tower of London in 2014, Blood Swept Lands and Seas of Red art installation (more commonly known as The Poppies), has been making its way to various historical landmarks around the country in the form of two sculptures Weeping Window (a cascade pouring from a high window to the ground) and Wave (a sweeping arch of poppy heads suspended on towering stalks). Both were key features of the original installation commissioned by 14-18 Now and created by artist Paul Cummins and Designer Tom Piper. Until 8 July you can catch Weeping Window at Carlise Castle, which was HQ for the Voluntary Training Corps in WW1, after which it will move to Middleport Pottery in Stoke-On-Trent. The poppies’ final location will be the Imperial War Museum, London, to close the WW1 centenary commemorations. 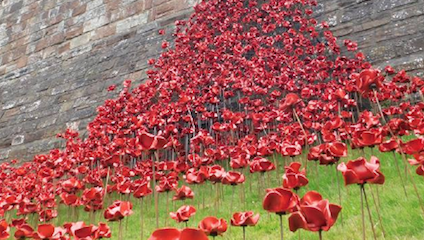 The Poppies will be shown at Carlisle Castle until 8 July, when they will move to Middleport Pottery, Stoke on Trent from 2 August until 16 September. Combining the centenary of Women’s Suffrage with that of WW1, Katrina Palmer’s The Coffin Jump at Yorkshire Sculpture Park is inspired by the role of women in the First World War, namely the First Aid Nursing Yeomanry (FANY) who helped treat and evacuate men from the battlefield. The British Army refused to be associated with the FANY women, who instead did their bit by aiding the Belgian and French. Palmer’s sculpture depicts a female rider on a horse, leaping over an obstacle, which inscribed with the phrases “woman saves man” and “nothing special happened” which pays tribute to the understated bravery of women during WW1. The Coffin Jump by Katrina Palmer (artist impression). Image Credit: Yorkshire Sculpture Park via Facebook. The Coffin Jump will be shown at Yorkshire Sculpture Park from 16 June 2018 – 16 June 2019.